Many Thai students grow up thinking that their English ability is next to nil. But sometimes, a few confidence-boosting classes with a native speaker – where they’re understanding more than they expected to and communicating right back – is all it takes to change their minds. As a volunteer English teacher, you become a catalyst for student development. In this project, your daily commute will carry you through some of central Chiang Mai’s and Bangkok’s most authentic neighborhoods. All of the involved schools are in the city center – most within the boundaries of the ancient moat. Some are part of larger temple complexes, complete with monastic communities and Buddhist shrines; others are stationed on dedicated school grounds. Each has its own dynamic, with anywhere from 100 to 1,000 students enrolled. Volunteer teachers have the option to work in any grade level. Across Thailand, the school day begins with the raising of the flag and the singing of the national anthem. Students line up in uniform according to their grade level or home room. This is your chance to dole out a few good mornings and give your students a chance to practice the conversational skills you’ve been teaching them. From here, it’s off to class. Lunch is also provided for volunteer teachers. You can take lunch with students or other Thai teachers, or you could strike out for street food and a few minute’s solace. There’s no shortage of organizations advertising teaching positions in Thailand and greater Southeast Asia, and many of these place teachers in well-funded private schools where the teachers end up feeling more like showpieces than meaningful contributors. Nothing drains a volunteer’s resolve quite so effectively. Friends for Asia actively seeks schools that have no foreign teachers on staff. These are financially strapped public schools that are thrilled at the opportunity to welcome native English speakers. In Thailand’s public schools, members of the English faculty are well versed in grammar and mechanics. If anything’s missing, it’s the fluency that develops through practice in a native-speaking environment. Regardless of your teaching background, your mere presence in this public school gives students and faculty the chance to take their English skills out of the textbook and put them to work in the real world. But there’s more to this arrangement than language arts. For many of these students, this is the only chance they have to meaningfully interact with a Westerner. The classroom is a world away from the tourist scene, and you’ll be in a unique position to influence the way these children grow up thinking about foreign cultures. Your role in class depends on the school as well as your own comfort level. You’ll be paired with a Thai teacher and have the option of going into class with this person and simply helping out with daily lessons. However, for anyone with the confidence and the drive to do their own lesson planning, nothing’s quite as rewarding as leading your own class. 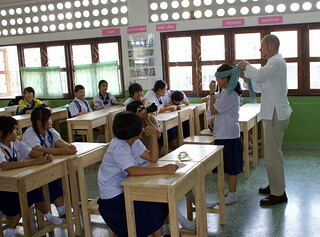 The students love it, and it gives Thai teachers the chance to catch up on projects and paperwork. The time you’ll spend in class depends on the school’s needs as well as the time of year. Generally, you’ll be in front of students anywhere from 10 to 20 hours per week. Volunteers with plenty of ambition can donate more time planning and possibly helping out with projects at school. Volunteer English teachers have to be at least 18 years old to be considered. It’s also important that they’re fluent in written and spoken English. While veteran teachers are enthusiastically welcomed, teaching credentials are not required to volunteer to teach English in Thailand. Beyond this, Friends for Asia requires all volunteers who will be working directly with children to file a certified police background check before their start date. Plane tickets, travel insurance, cost of criminal police background check required for this project, cost of transportation to and from the school and accommodation (roughly $2 per day), ride to the airport after service, lunches on weekends and dinner.